Tool Blog Cool Tools How Much Is A Finger Worth? While it would be hard to put a price tag on your fingers, I think I can safely assume they are worth more then $1500. This $1500 number is the base price of the SawStop Contractor Saw. During this safety week, it would be hard not to include the SawStop brand which truly revolutionized table saw safety. While there are plenty of safety techniques, and jigs that can help keep you safe, even the most experienced table saw user can have accidents. What could be more safe then a saw that wont cut you? 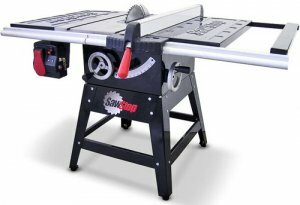 For those of you unaware, SawStop makes table saws that use a braking system to stop the saw blade if it comes in contact with skin. The system works so well it can stop the blade within 5 milliseconds of detecting contact with skin. SawStop saws detect contact with skin. The blade carries a small electrical signal, which the safety system continually monitors. When skin contacts the blade, the signal changes because the human body is conductive. The change to the signal activates the safety system. Even though I have never used a SawStop saw, I think they deserve a huge thanks for making safe tools, and continuing their research for future products.